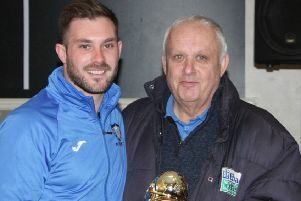 North Shields central defender John Parker has been crowned the George Thompson North Shields Player of the Year, in his second season with the club. John suffered heartbreak at Wembley a couple of years ago when with West Auckland but his second appearance this time with the Robins more than compensated. Scorer of three goals this season – at Bishop Auckland, Marske and Ashington – Parker is a must have bloke in the dressing room, a totally committed player. Of course it had to be hot shot Gareth Bainbridge who picked up the Don Winskill Golden Boot after he netted 48 times this season to mark a quite remarkable 103 strikes for the club in a mere 91 turn-outs. Gareth also was proud to receive as well the Supporters Player of the Year award and a ‘special ‘ Ultras trophy. Bainbridge came a close second in the Goal of the Season award for his third goal at home to Whitley Bay, just edged out by Kieran Wrightson’s stunner – his side’s fourth against Bay but this time at Hillheads. Graham Fenton picked out lively front runner Dean Holmes – 18 goals plus many assists – to receive the Managers Award whist Kevin Hughes who has skippered and steered the side throughout with composure accepted the trophy voted on by his teammates, the Players Player, from ground sponsor Daren Persson and club president Malcolm Macdonald.